A fir tree arrived from the further north of Northern Europe. In the German-speaking world, there is a custom to decorate the tree on the morning of the 24th. When farmiliar faces get together, the presents under the fur tree pile up higher. Sooner or later, someone will light the candle one by one. Father telling a Christmas story to his children. Music scores of the hymns. Sound of an organ. While it is peaceful, you feel some solemnness in the air. Wishing you all a wonderful night. All of these are the spices used for cakes and cookies for Christmas. Such aroma was floating in the air from the Central station building, Christmas markets and hot wine stands along the streets. 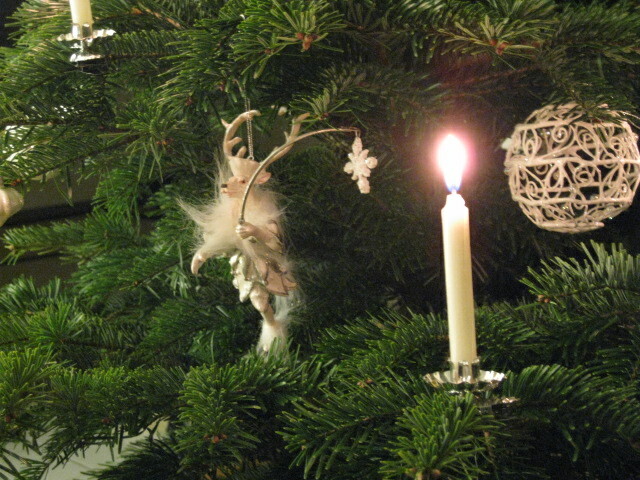 The period from the fourth Sunday before Christmas is called Advent in the German-speaking Swiss region, and everybody starts to prepare for the Christmas. People get excited and happy. It is just like the joyful but restless moments before the New Year in Japan. We look for presents for each member of your family and relatives, which requires certain days to give each a different wrapping. Illuminations will be lit and big Santa will be on the wall in the house where children are around, and the wreath on the front door is another element to consider. I have changed my potpourri to the one of Christmas flavor. When I had my face close to the branch of the fir tree that was just chopped down, I could smell the cold and tranquil forest. This should be also arranged around the potpourri. There were 4 candles for Advent. 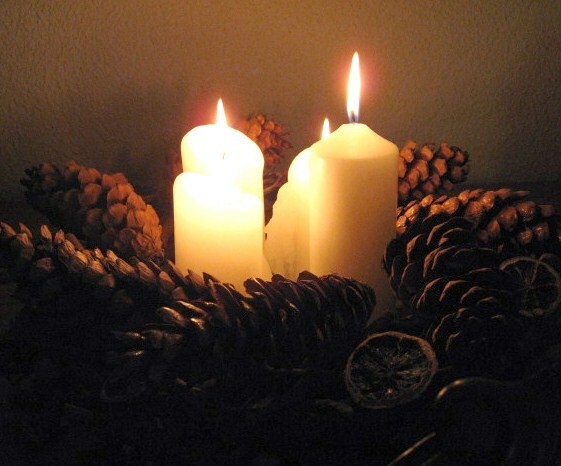 This year, one candle was lit on the last Sunday of November, and on every Sunday since then, the 2nd and the 3rd candles were lit. Today makes the 4th one to be lit. While the classical decoration means ribbons or ornaments over the evergreen wreath, that varies depending on the family. Whatever color or design that you like. Since the first-lit candle becomes the shortest, some people design so that the candles will be of different height. Although we enjoyed covering the whole floor with tree branches and used blue candles last year, this year gave us a different mood. We thought Sarabande might be suitable to listen, so we selected D major. In accompany with the slow melody of cello, we idly gazed at the shadows of the candles. Outside is -10 degrees. Over the snow that fell last night, frost flowers are sparkling radiantly. Every year, from autumn to winter season, we welcome guests from Japan who come at random. And usually they come here as treats for themselves, such as because they have just finished some project or it is the right time to have a break from work, and so on. Quite often they come as solo travelers. Although these people may be quite demanding, they know what they want and are very independent. Therefore, it is fine to let them to be themselves during the day, as they know how to enjoy themselves. However, the problem is the evening part on how to make them satisfied. If it is in the cold season, we would like to recommend some opera, after all. Therefore, quite often, their schedule may be slightly adjusted, after we go through the program beforehand. 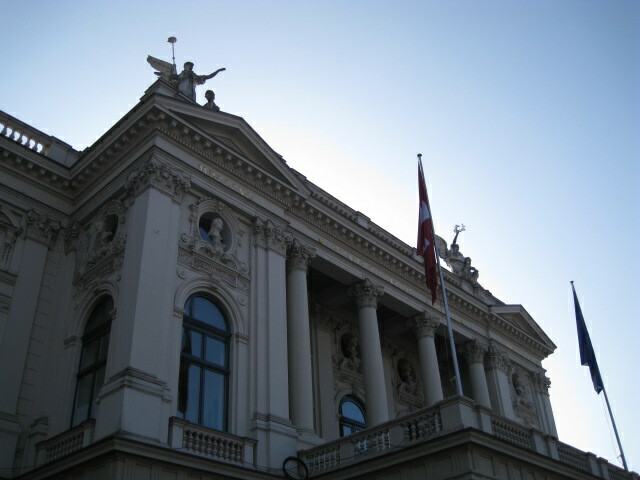 Zurich Opera House is solemnly situated near the lake. At the moment, it is one of the hottest opera houses in the world. It is also known as one opera house where the performances shown from September to June are of top level and it is hard to obtain tickets. In the fall of 2007, “La traviat” and “Der Rosenkavalier (The Knight of the Rose)” were performed in the Orchard Hall in Japan. It was a hot topic of town as excellent opera singers were lined-up lavishly on stage. The Aktientheater build in 1834 was the predecessor. It was the venue where Richard Wagner, who went into exile in Switzerland at that time, demonstrated his talents. Even now, I understand that there still remain quite a lot of musical notes of Wagner in an antique shop near the university. 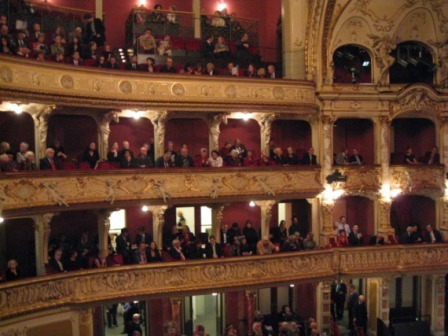 This theater was burnt down in the past, and the current Zurich Opera House was build in 1891. We understand that eminent big-time masters such as Wilhelm Furtwangler, and Richard Strauss, as well as Wagner were hired to perform on the stage, and the success and its reputation overwhelmed the Europe. The House accommodates 1100 seats. Although the exterior and the interior are beautiful and massive, it is rather small compared to the counterparts of Paris and Vienna. It is just like a cute princess. However, the convenience of the location and the economic power of Zurich play a great role here. Furthermore, the country has 4 languages and English is spoken normally. There are many people who speak 2 or 3 languages. Among my Swiss friends, some has an excellent skill to switch languages whenever she goes across the border within Europe. It is a great advantage not to have a language barrier. Italy, Germnay, Austlia and Easter European countires. Each program has the world’s top class singers all lined-up. This town has all the required conditions to attract and focus on such vast range of talents. The Opera House welcomed Alexander Pereira, present General Manager, in 1991. Since then, under his firm leadership, the Opera House has been gaining the momentum year after year. The annual performance repertory holds 32 to 35 performances, 15 of which will be totally new interpretations. While it indicates that at least 1 performance will be a new one per month during the season, it is considered almost impossible frequency in the general opera world. Franz Welser-Möst, who was appointed as the Chief Conductor in 1995 and served as the General Music Director since 2005, will become the General Music Director of the Vienna State Opera in 2010. This position was suceeded by Italian Daniele Gatti in June this year. The production is Verdi’s “Corsaro.” Corrado, the chief corsair, is performed by Vittorio Grigolo who is now on the rise. His lover Medora is performed by Elena Mosuc, female slave Gulnara by Carmen Giannattasio, and Seid who loves her, by Juan Pons. Grigolo who stands between two sopulano is just perfect. Last fall, by using the Zurich central station building as was, involving the people after work and the audience, “La Traviata” was performed and simultaneously broadcasted on TV. The singer who played Alfredo there was this Grigolo. While he was a wonderful singer, it was interesting to see a glimpse of his mischievous character during the interview, which made me his fan, anxious to listen to his voice in other performances. 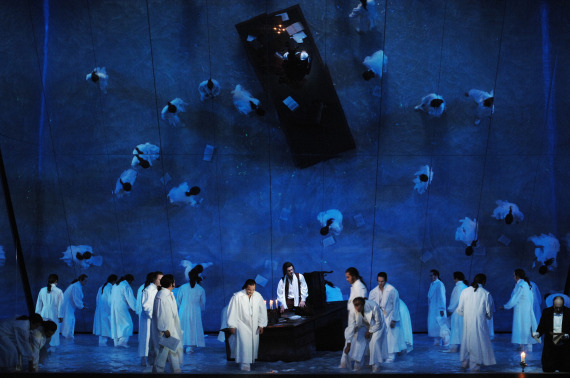 Furthermore, in this performance, a young Japanese tenor, Mr. Shinya Kitajima, made his debut in the role of Selimo. Later on, I had a chance to talk with him. I think these words of Mr. Kitajima represent the characteristics of the Opera House. As for the “Corsaro” this time, when I asked the support members of the Opera House, most of them responded that they had no idea since the conductor and singers would be performing for the first time and the program was rarely performed. However, day by day, reputation brought another reputation, which resulted in all fully booked performances. Especially we noted the originality of the choreograph, such as the water on the whole surface of the stage to reflect on a huge mirror, sophistication of lighting and perfect tempo, all of which never bore us. Surprises and unexpectedness developed one after another. We stepped out into the balcony holding champagne glasses at the interval. Although the glitz of the lobby was nice, the heat of the stage directly came into the air, which overwhelmed us. Cold night breeze was so refreshing. Having the 6th curtain call, the opera house was filled with another roar of excitement. For this type of challenging and dynamic stage, the audiences gave generous applause. 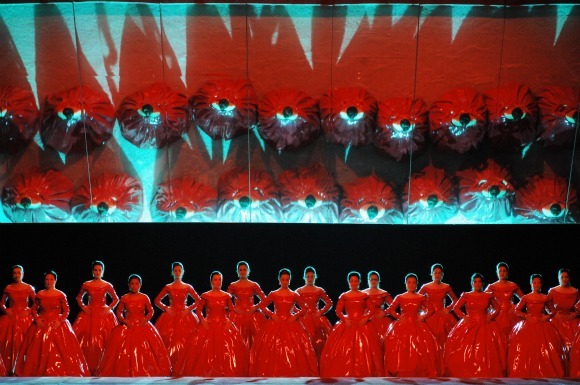 The high quality of such audience is also, I believe, a sign of high recognition in the world of opera house. One Sunday afternoon, I had a chance to go to the forest. 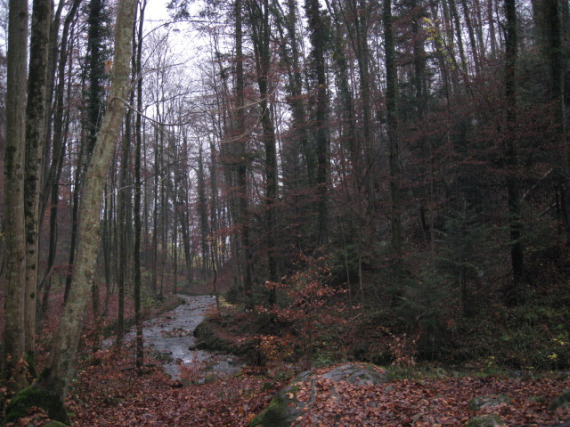 Although the Lake Zurich is nearby, you can easily access to the forest within walking distance from the central area of the city. Walking or jogging in the forest has become part of our daily life here. The place I went this day was along the shore of the Lake Zurich. The forest was stretched out near my friend’s house. “Well, the weather turned out just wonderful,” a smiling blond intellectual-looking young man said, looking up the rainy sky. Holding hands with a small boy wearing rain boots, singing German song that I had no clue what it meant, we climbed up the hill slowly, by walking over the fallen leaves. When we turned into a small lane, my tip of nose sensed something refreshing. I breathed in the deep smell of the forest. Once more, I breathed deeper. Numerous lofty trees connected the earth and the sky. The moist air from the drizzle in the morning fallen on the ground, and everywhere was filled with this moist air. When crossing the stream, you could feel some slippery touch underneath the shoes. Big and small pebbles here and there were covered with soft moss. They walked through easily by stepping the stones one after another. Once in a while, small breaking sounds of twigs were heard. 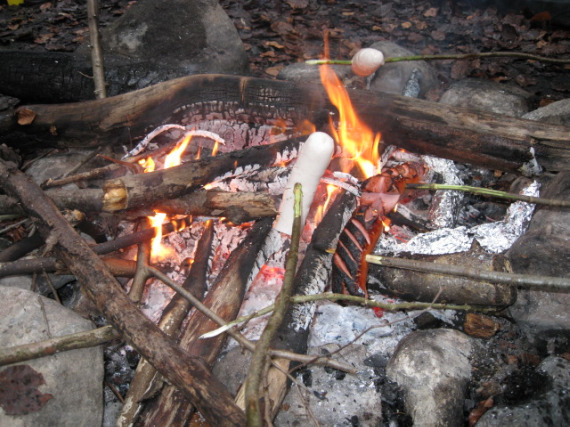 Today’s goal is to make a fire in the forest, and to grill big sausages called Bratwurst. We all spread out in the forest to find some long branches. What would happen to someone like me who had never had anything to do with the life in the mountains or forests, when participating in such an unfamiliar event and faced such an unknown situation? Feeling simply impressed with the fact that these people have been living in touch with nature since their childhood, and at the same time, being fully aware that I would be no use here at this moment, I silently became the keeper for the Bratwurst. No, it may not be true. As a matter of fact, I did not know what to do. I was just wandering around. While the army knife of VICTRINOX is well-known in Japan, everybody here has a well-used knife of his own. Taking them out of their pockets, they skillfully made skewers by sharpening the tip of the branches. I have heard about the story that Swiss children go to barbecues by carrying one sausage of their own, and now I realized this would be the adult version. It might not be wrong to say that most of the people working in Zurich spend their weekends in the forest in a varied form of this kind. I wondered if this was the forest frequently visited by the people in the neighborhood. Stones were already piled up. We saw branches of beech tree, larch, and popular and so on. While placing thick trunks, we horizontally poked each “own” Bratwurst into the sharpend tips of the branches mentioned earlier. Although I felt poking them vertically would be easier to eat, there must be some reason whey they placed them horizontally. Everybody had their own way of making cuts on their sausages. That, also might be their tradition of each family. Let me repeat, you grill you own. More specifically, you change the angles to roast. Sitting on a fallen tree, by checking the directions of the wind and smoke, you put out your stick over the burning fire. I found a big stone nearby which could turn to a table. When your own Bratwurst turns to nice brown color, just take it there. Now I somehow understood the reason whey they had been placed horizontally, instead of vertically. However, they took them out of the sticks. Nicely browned Bratwurst sausages were, of course, very hot. But they grabbed them by hand to eat!! Still this way of eating food exists in the present time, like a tail of ancient days. What a primitive but wonderful way. To me, grabbing the food to eat in a situation like this, looked very cool. Feeling the closeness of comrades, I simply imitated their ritual. Around the fire, tranquil and comfortable time went by. Out of nowhere, appeared some boys with flushed faces. Although this area is not far from town, there may be some secret lanes deep in the forest for these boys. Connoisseurs of fine wines may know this. There are many great wines in Switzerland. Furthermore, as the types and characters of grapes vary depending on the area where the language is spoken, a vast variety of wine was born. When I went to the jazz festival in Montreux, I had a chance to taste the white of Laveaux, which was just wonderful. Well-known places for white wine using Chasselas grapes are Vaud near the Lake Leman, as well as Valais in its south and along the Lake Neuchâtel near the French border. When you talk about the red, white and rose of Merlot, it will be Ticino in the area where Italian is spoken. Where you can find wines that share similar tastes of Pinot Noir or Pinot Gris from French Alsace, or that from Baden in Germany, will be around the Lake Zurich and the western Switzerland. Just for your information, we also have what we call, Zurich wine. I hear that some grapes that were planted in the Roman Era are still grown. It is really amazing to know that tens of different kinds of grapes are grown in the wine regions in this country which is about the same size as Kyushu. Why there aren’t many Swiss wines in Japan where gourmet foods collected from around the world? That is because the Swiss love wine very much. It does not mean that we do not export any, but since the people here drink wine 3 times the quantity of the domestic production, as a matter of fact, and the shortage has brought more and more imported wines. I thought that they did not want to share something delicious with other countries, but now I understand what the reason was. First of all, the grapes grown on the land where machines are hardly used because of its steep slopes, are only picked up by human hands, and also because it requires lot of traditional manual methods to make wine, they are overwhelmingly in short supply. It seems like these conditions are the background. For the 2 weeks up to the mid November, just to be in time for Christmas, Zurich holds a large-scale wine exhibition every year. From Bürkliplatz where Old Town and the financial district meet, not only sightseeing boats but also commuter boats run to various places. 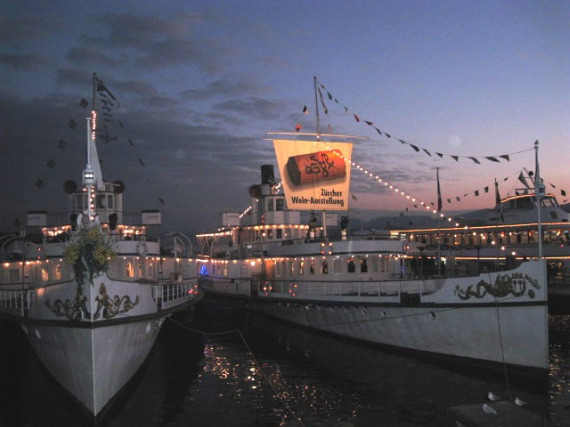 The annual EXPOVINA, commonly known as Weinshiff, is held here, by having 12 boats lined-up and anchored at this old pier near the Lake Zurich. It is open to public and it is the world’s largest wine expo. It stared in 1953 and this year celebrated the 56th anniversary. 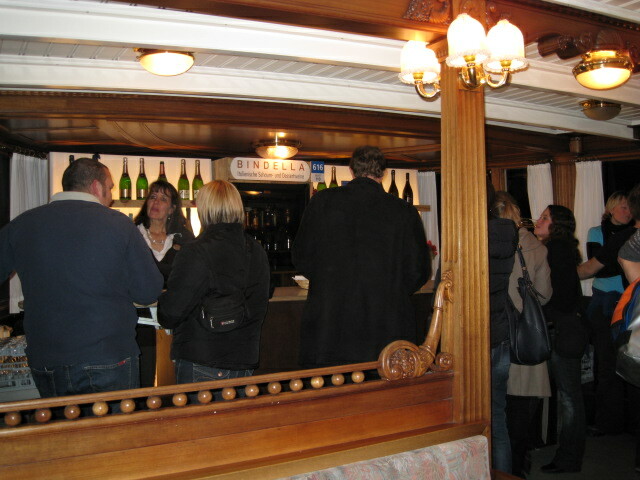 More than 120 booths of wine producers and importers, were set up in the 12 boats. 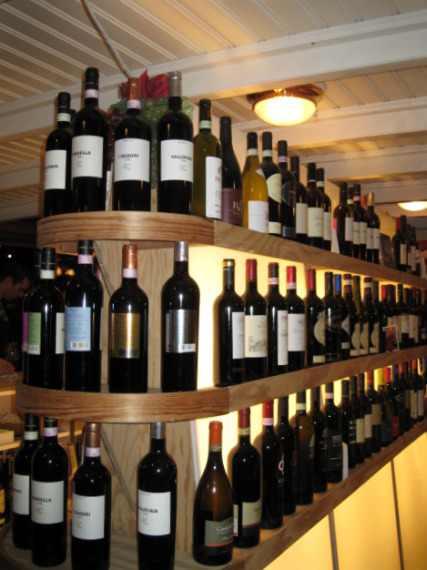 When it comes to the number of different types of wine, it will be easily 4000 at the least. Carrying the catalogue given at the entrance, you go around the booths you wanted to try, and after tasting, you check those names corresponding to the booth numbers that you liked, to put down the points. Having visited several times in the past years, I thought I was starting to get the hand of it. 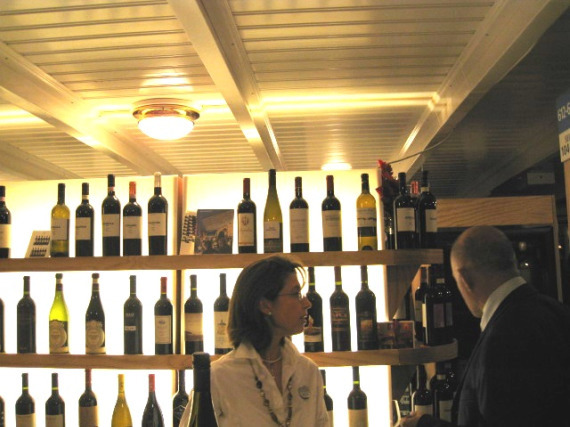 However, since the number of displayed wines is tremendous, it is too audacious to think about completing the tour of the whole 12 boats including the one that turned to a Swiss restaurant, in a single day. Your tongue, nose and inside your mouth will become blunt for judgment, or in other words, in my case, you cannot trust your taste buds any longer. This year, there was somewhat unusual Spanish Rioja in the very left boat, but since the boat was swinging due to its small size, we moved on quickly to the next boat. Although other boats were anchored steadily and no worries of sea sickness, once you started from fruity white, by listening to the explanations by the dealers, and moved on by thinking “Well, next I should try a little heavier red” and so on, you would feel too great and your spirits would be high after you have tried the 10th one. First, I went with my friend who was a wine-tasting professional to go around. However, I did not decide on certain label that day, and went back again on a different day for more focused direction, to try some interesting ones that I usually do not drink. What we wanted to go after was German white. 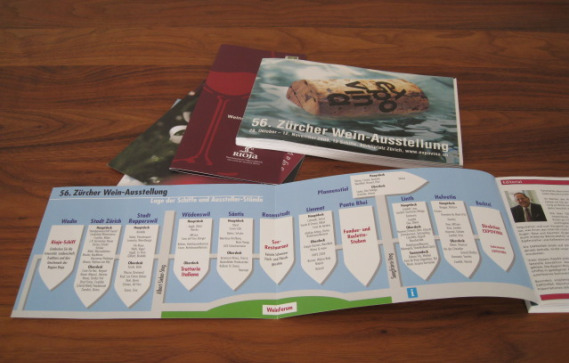 Baden, Pfalz, Saar, Rheinhessen, Rheingau, and Mosel, we tasted along the Rhein. While I always thought that German wines were sweet, tasting those wines made me realize that my knowledge was too premature. There were many bottles that demonstrated refreshing, deep, and elegant tastes. Finally what we decided was Sheurebe of Mosel and Riesling, as well as a sweet one of Sheurebe which gave us the impression to be the one to taste after the Christmas dinner. Although 6 bottles were the minimum to order in general, some booth started to be more flexible so that we could mix 6 different bottles for one order. It was Friday night. In addition to some relaxed couples, people after work started to join us. Very attractive 2 women, assumed still in their 20s, were asking the dealer many detailed questions one after another. Over there, one young man with backpack was taking notes, while a senior couple was relaxed and enjoying the conversation at the counter, checking the list. We moved around the Swiss wine section, but the surroundings of popular wines turned into a place for social interaction. It was so jammed that we changed our direction to Italy. Although the order was totally reverse, we were able to take a break with chilled Prosecco, an Italian sparkling wine, which we casually order as aperitif in restaurants in Zurich. We sorted out our cellar in the basement to welcome those wines we ordered, but still waiting for their arrival.